For those of you who’ve followed this blog for a while will see that I’m always revisiting the answer engine concept, most recently two months ago. A month before that I mentioned it in the context of a a Journal of Clinical Q&A. This all stems from my belief that Trip is a wonderful tool to answer clinical questions but a also belief that it could be even better! After all, it was the reason I started it in the first place – to help me answer clinical questions via the ATTRACT Q&A service. Surveys have shown that many clinicians agree, with over 70% of questions, supporting clinical care, are helped by using Trip. The answer engine will try to predict questions from the search terms and insert an answer above the search results. Users will get an answer in one click. 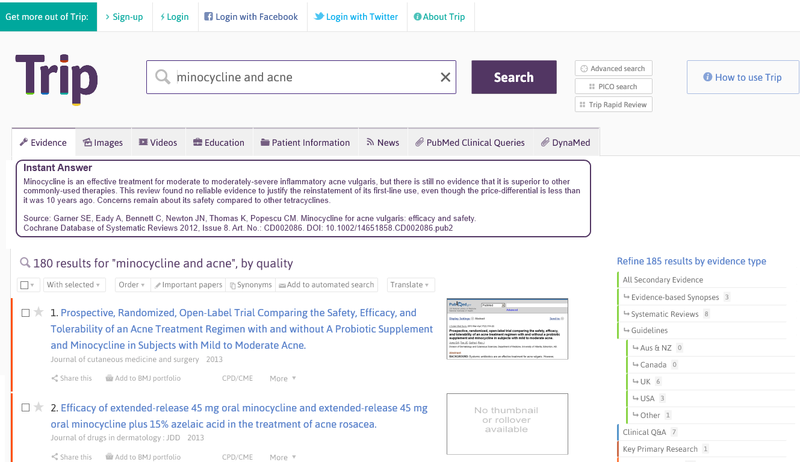 Journal of Clinical Q&A is a journal idea – radically different from any other journal. It will be a structured answer to a clinical question, posted on the site (and helping populate the answer engine) which will be peer-reviewed and given a citation. So far, fairly radical and fairly good. Users types in their full-text question. Users then select the PICO elements from the question. Users are given the option to write up an answer. If they write up the answer we will show them the articles they’ve looked at and they can indicate which were useful (and thereby form the reference list). They can choose to keep it private or share it – feeding the answer engine. Another powerful component for a Q&A environment, what could go wrong (I ask tentatively!)? Yahoo Pipes have been around for a while now. Unfortuantely, I’ve not had the time or inclination to dig around and see what they can do. I’ve now started using them and think they are potentially very powerful. I’m sure, at present, I’m using them crudely. In fact, I’ve so far, simply merged two separate RSS feeds – but it’s a start. I’ve always wondered about auto-updating of answered. Therefore, I created two separate searches in PubMed (with exercise and depression both as [majr] mesh headings), one for RCTs and one for systematic reviews (via clinical queries) and restricted the date to those articles published after the ATTRACT answer. I then exported the results as an RSS feed and joined them together in Yahoo Pipes. You can see the results here. If this output was then tagged to the bottom of all appropriate Q&A answers they would, in effect, auto-update.